What is Fortune Cookie Soap's The Soap Box? : The Soap Box is a quarterly subscription box by Fortune Cookie Soap that features eight exclusive FCS mini items from a new collection prior to the launch of the new collection. Each box also comes with a $10 FCS gift code that you can use in the store. How Much is Fortune Cookie Soap's The Soap Box? : The Soap Box is $19.99 for US customers, $24.99 for Canadian customers, and $29.99 for International customers. The price includes shipping! Prices listed are for the full-size products. 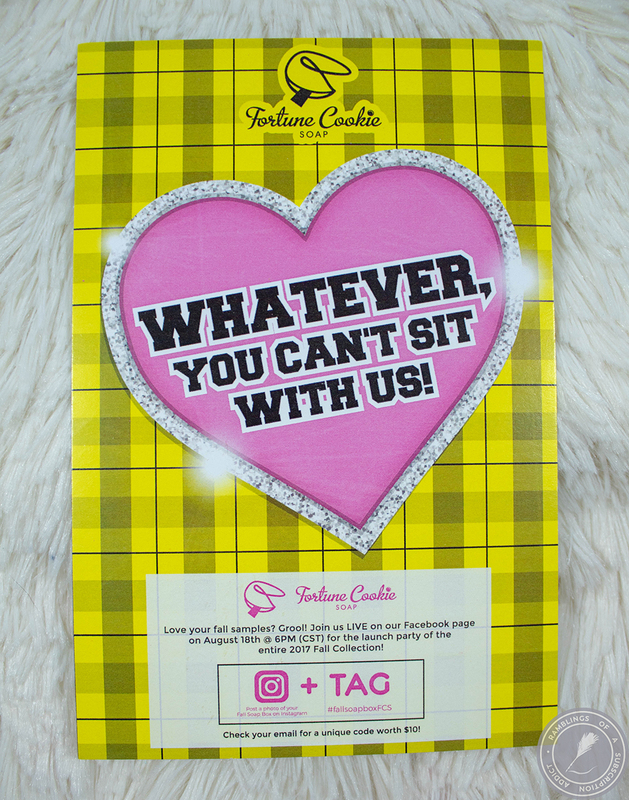 Oh yes, it's a mashup of Clueless and Mean Girls. Leave-In Conditioner (CRUSHIN') ($9.99) - I really love their leave-in conditioner formula. I find it helps my ends stay slightly tamer than what they are naturally and definitely helps the dryness. The scent is a little on the super sweet side but not too much if you don't use a ton and let your hair air out a bit after use. OCD Hand Sanitizer (Totally Grool) ($2.89) - I have a literal collection of hand sanitizer (and whipped cream) on my vanity to throw in my purse and this was definitely added to it. It smells like bubblegum, one of my favorite scents) and I'm guessing it kills bacteria. Like most hand sanitizers, it is a bit on the drying side...which is why it stays with my whipped creams. Perfume Oil (Way Fetch) ($8.99) - If you've read even just a few of my blog posts, you'd know I don't do perfume oils. I'm clumsy and spill a lot and oils mess up your clothes... so it's been given away. Smelled good, though, like fall on the seaside. Whipped Cream (Boo, As If) ($6.99) - The scent mixture of lemon butter shortbread and caramel is weird, but not so much that it's not super close to being empty while sitting on my vanity. I love their whipped cream formula and even have given a few away to share the love, but only scents that make me sneeze...I'm not that nice. 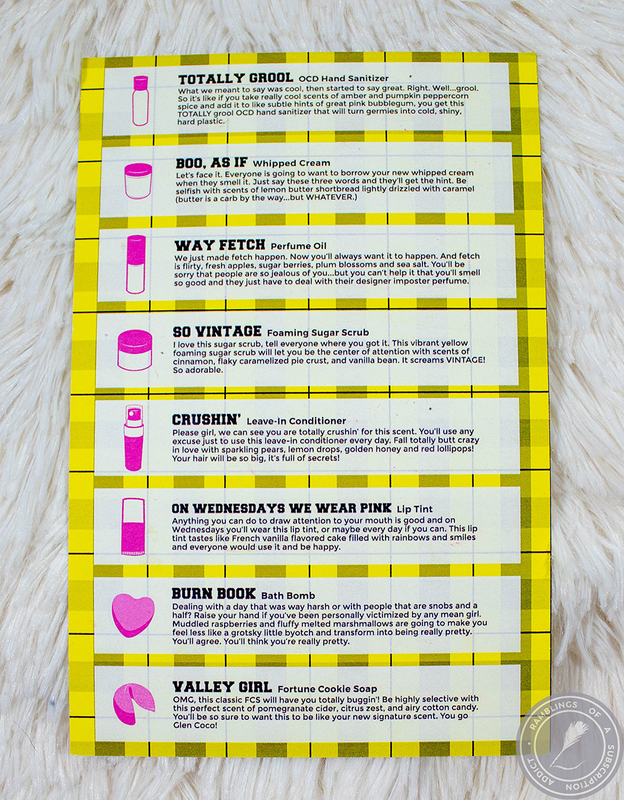 Foaming Sugar Scrub (So Vintage) ($12.99) - I actually passed this along, I rarely use sugar scrubs so I pass along quite a few just so they don't get wasted/go bad. The scent did remind me of the Vanilla lotion from Bath and Body Works from like 15 years ago. Lip Tint (On Wednesdays We Wear Pink) ($4.49) - When they said this was a lip tint, they meant it in the most tinty way. There's almost no color on my lips (my lips are naturally pretty pink so it might just be a 'me' thing). I passed it along. Bath Bomb (Burn Book) ($5.25) - As I've said before, I'm not one for baths so I'm definitely not one for bath bombs. I do keep some to break up and use for mani bombs from time to time, but not many. I gave this to a friend that loves all things bath bomb. Overall, the theme of this box was adorable and the items were so cute and pink. I really miss getting the Soap Box, it introduced me to so many things without having to get full-size products.